Let’s get things out in the open right from the start… I am not gluten intolerant. So, why am I experimenting with gluten free baking? Well, I happen to have people in my family who ARE gluten intolerant. Because I do a fair bit of baking, I’ve been challenged by my daughter to change at least some of my recipes to gluten free. Ok, challenge accepted. With Thanksgiving on Monday, I decided it was time to try making a gf dessert – Lemon Meringue Pie. This morning was spent looking up gluten free baking and recipes for pie pastry. I’ve got the filling down pat; I’m using a recipe I’ve been making since high school (a very long time ago!). The recipe I settled on was this one, from Gluten Free Girl. I’m following the directions from a Serious Eats recipe, one that worked very well for me last week when I baked an apple pie. One thing I noticed right away is that the dough is much whiter than my regular pie dough. That may be the result of the flour blend I’m using, I suppose. This particular blend is a mixture of white rice flour, potato starch, tapioca flour, and guar gum. The directions say to substitute 1 cup of wheat flour for 1 cup gf flour mix so that’s what I went with. The slip of paper that came with the gf flour reads “This Gluten Free Flour blend is good for breads, cookies, cakes & most general gluten free baking”. Right now, my pie shell has been baking for about 10 minutes; I’ve just removed the parchment and baking beads and it’s back in the oven at a lower temperature to finish baking. Ok, I let the bottom get a little dark. At least I know it’s baked through! In my reading, I read a few posts that said that an all butter crust doesn’t always hold its shape well. Many suggested freezing the pastry for about 15 minutes to half an hour before baking so I did. I must say it held its shape quite well. I’m pretty happy with it, all in all. As I’m writing this post, I’m also baking this pie. This is real time blogging! At this very moment, the pie is back in the oven. The lemon filling is in, the meringue on top and it’s baking for a few more minutes, until the meringue is lightly browned, just the way we like it. Unfortunately, I can’t tell you… .yet… how it turned out. I’m really happy with the appearance. There were some bits of pastry stuck to the parchment and they were pretty flaky and tender but the proof, as they say, is in the pudding. It needs to cool; it needs to set. Thanksgiving dinner must be eaten. Only then will dessert be presented. If we can wait that long. I’ll let you know. It didn’t take long at all. 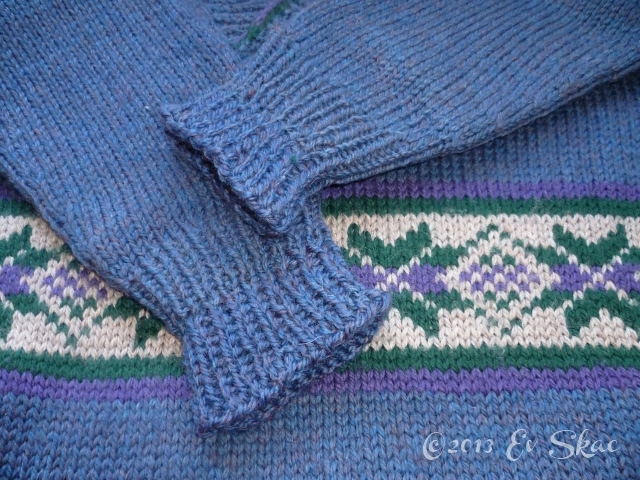 Once I got the sleeve stitches on the needles, it only took half an hour or so to reknit and cast off the cuff. After the first one was complete, John commented that I really didn’t have to do the second cuff; it was fine, after all. And, besides, who’d notice? Then he looked at me. “Oh right,” he said, “you would.” That’s when he stopped talking silliness. All in all, it took just over an hour to repair and reknit the cuffs. There’s a little bit of a pucker where I joined the new yarn; I anticipate that will even out after the next washing, which will be soon. John’s sweater should be good for another few years. He’s happy; I’m happy! In other things, on Friday I took a few minutes of my lunch break to go over to the thrift store a few doors down from where I work. I’ve found a few things there over the years, as any of my regular readers will know. This time, I came home with two pieces of fabric. Since I’ve been having so much fun making the zippy pouches and other quilty type things, I couldn’t resist these fabrics. They’re so colourful! And cute! 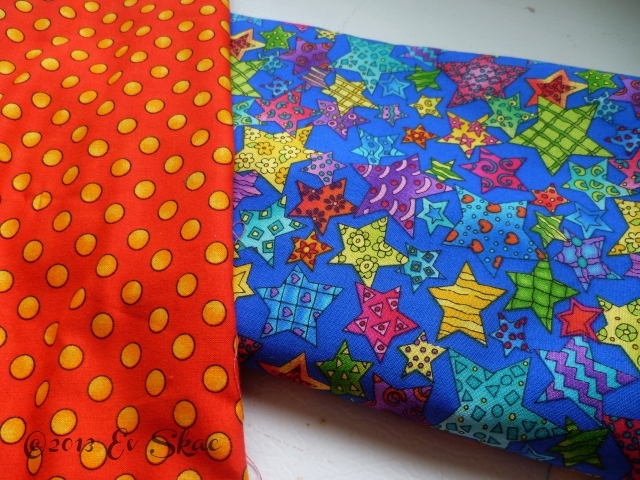 The blue piece is about 1.4 metres (.70 m wide) and the orange one is just over half a metre… all for just under $5.00. Now, I just need to find the time to do more sewing! Instead of sewing, I have been knitting. The Metalouse shawl saw some progress last night; I have about 24 rows (give or take) left to work. Today, I’m baking. There’s Sourdough Rye bread rising and up next is Boston Cream Pie. I’ve been craving that lately, for some reason. There will be pictures!